The Property: - Ideal for anyone seeking a truly rural property this charming home has been developed from a former estate cottage and combines many character features like exposed masonry, roof timbers and fireplace with a preserved adjacent bread oven with modern concepts like large picture windows and structural steelwork. Location: - From this property it is only a couple of minutes to the B4580 Tanat Valley road and this gives swift and easy access into Oswestry where there are the usual market town shops, services and amenities. More locally there is a good village community in Llangedwyn with a village school, hall, church and pub / restaurant. The nearest local shops are in Llanrhaeadr about 2 miles away. Aside from the village school there is transport provided for older children attending Llanfyllin High School. The nearest medical centre is in Llanrhaeadr and hospital in Shrewsbury. Travelling distance to Oswestry - 9 miles and Shrewsbury 20 miles. Porch: - 2.50m x 1.20m (8'2" x 3'11") - Double glazed with solid timber door and slate tiled floor, a further door leads into the entrance hall. Entrance Hall: - 7.30m x 3.00m (23'11" x 9'10") - (Average width) This well designed space links the old and new parts of the building and is open to the full ceiling height. A pine stairway is the central feature to an open tread design and this leads to a first floor bridge linking the upper bedrooms. To the rear is a full hight picture window and exit door which faces south and there is room in the area for a dining table if required, the current owners us the space as a further sitting room. Part of the walls show the exposed original stone masonry and this contrasts with exposed structural steelwork in the construction. Double glazed window to front, oak finish floor with under floor heating. Inner Hall: - Leading off the hall to the right with store cupboard and oak finish floor with underfloor heating. Lounge: - 6.00m x 4.00m (19'8" x 13'1") - Large deep set traditional fireplace finished in stone and brick with arched mantle and preserved recessed bread oven, lpg (gas) fired cast iron stove. Double glazed windows and door to sun room, wood effect floor with underfloor heating. Study / Sun Room: - 2.50m x 4.00m (8'2" x 13'1") - With double glazing, sunny aspect, Velux roof window, door to patio deck, internal door to garage and air conditioning unit. Wet Room / Utility: - 2.50m x 2.00m (8'2" x 6'7") - Dual purpose room with sealed floor, flush drain, wall mounted electric shower, tiled splash backs and screen. Under floor heating, double glazed windows to front and side, sink unit with base unit and work surfaces, spaces for appliances, access to loft space with ladder..
Cloakroom: - Contemporary white suite comprising corner hand basin and WC. Tiled splash backs, tiled floor with underfloor heating, double glazed window, fitted wall cupboard. Inner Lobby: - Located off the left from the hall and giving access to the kitchen, ground floor bedroom and bathroom, oak finish floor. Ground Floor Bedroom 1: - 6.50m x 3.00m (21'4" x 9'10") - Featuring an unusual double glazed triangular bay window with sunny aspect and fine views, extensive range of built in wardrobes, oak finish floor with under floor heating, double glazed window to side, door to large adjoining wardrobe and store. First Floor: - First floor link bridge with bedrooms to left and right. Master Bedroom 3: - 6.00m x 4.00m (19'8" x 13'1") - (Overall measurement) two low cottage style windows to rear, oak finish floor, radiator, exposed roof timbers and exposed stone chimney breast with traditional former fireplace, built in cupboard and door to en-suite. En-Suite: - Suite comprises of 1500mm shower cubicle with mains pressure shower and low step tray, corner hand basin and WC. Tiled splash backs, chrome heated towel rail, mirror fronted corner cabinet, shaver light and socket. Bedroom 2 - 5.50m x 5.00m (18'1" x 16'5") - (Overall measurement) Stunning room currently used as an additional sitting room. Triangular double glazed bay window with glass roof and open views, double glazed window to side, large airing cupboard, two central heating radiators and access to boarded eaves space. Garage: - 5.50m x 3.50m (18'1" x 11'6") - (Average width) With up and over door, internal door to sun room, electric light and power, access to boarded loft space, adjacent hot and cold outside taps. Outside: - The property has well stocked cottage gardens to front and rear both of which enjoy fine views and the rear is south facing. Two driveways provide ample off road parking and there are pathways, borders, patios and decking areas. Outside lighting. Prospective viewers are asked to note that this property has garden only, there is no associated farmland attached to it. Services: - Mains electricity is connected. Water is supplied via a private borehole. Drainage is by a private septic tank. There is no main gas in this location. None of the services, appliances, central heating system, chimneys flues and fireplaces have been checked and no warranty is given by the Agents. Council Tax: - Council tax band C payable to Powys County Council. (Please note this may change on resale of the property). https://www.epcregister.com/direct/report/9568-6031-7293-3975-6970 This property has solar panels fitted. Directions: - Leave Oswestry on the A483 south towards Welshpool and continue to Llynclys. Turn right at the Llynclys Crossroads and follow this signposted towards Bala and Llanrhaeadr-ym-Mochnant onto the B4396. On reaching Llangedwyn pass through the village and pass the village school on your left. Shortly after this you will pass a farm on your left, just afterwards take an uphill fork on the right. Follow this lane until the property is seen on your right. 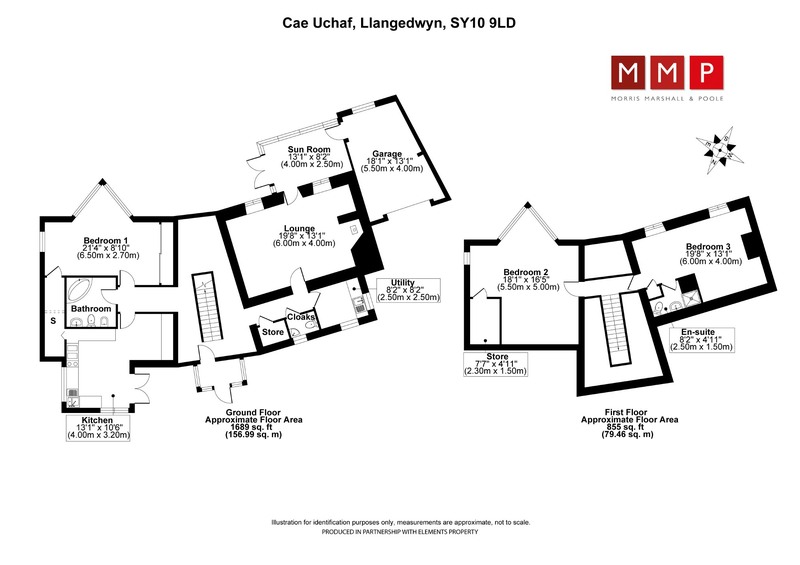 Agents Ref: - Oswestry Office: 16 Leg Street, SY1 2NN. Ref: MM / 014029. Date: 03/19.